Jon Mitchell, "Agent Orange on Okinawa: New Evidence," The Asia-Pacific Journal: Japan Focus, Vol 9, Issue 48 No 1, November 28, 2011. 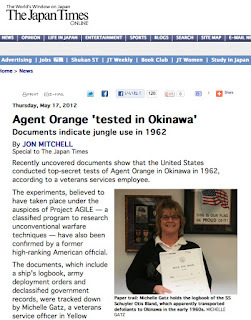 Jon Mitchell, "Evidence for Agent Orange on Okinawa: U.S. veterans speak about its harm to their health and their struggle for justice," Japan Times, April 12, 2012. Jon Mitchell, 'US Military Defoliants on Okinawa: Agent Orange,' The Asia-Pacific Journal Vol 9, Issue 37 No 5, September 12, 2011. アジャイル計画のうち、機密解除された文書のいくつかは、米国農務省図書館のエージェント・オレンジに関する特別コレクション内で確認できる。 Advanced Research Projects Agency, Project AGILE, R, "Semiannual Report, 1 July- 31 December 1963," found in Special Collections of the National Agricultural Library, The Alvin L. Young Colletion on Agent Orange, Series II. Military Use of Herbicides, 1950s- 1980s, File #340. PublicResourceOrg "Operation Red Hat: Men and a Mission". 27 分間ほどの映像記録で、アップロードしたPublicResourceOrgのメモによれば出典は以下。Operation Red Hat : Men and a Mission -- National Archives and Records Administration 1971 - ARC Identifier 3033306 / Local Identifier 175.79 - Department of Defense. Department of the Army. U.S. Army Materiel Command. U.S. Army Munitions Command. Edgewood Arsenal. (08/01/1962 - 1971).